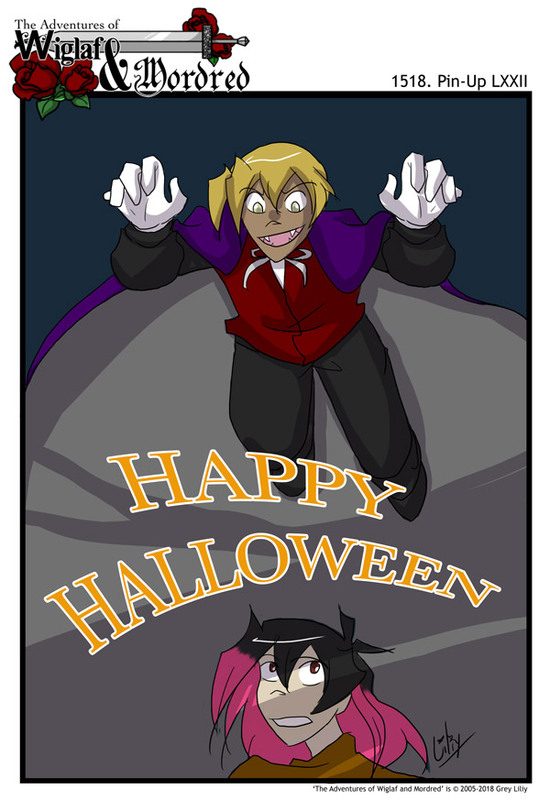 I can wish you all a Happy Halloween! Edit: Hey, guys. Bible study ran long & I have to be up early tomorrow. So Friday’s WaM got put on hold while I pass out. I have a busy weekend ahead, which means the next WaM’ll be on Sunday. On the bright side, you can look at Vampire Wiglaf for longer. On a side note, I also want to remind everyone that my site caching doesn’t always work. So if you leave a comment and it doesn’t show up, it’s probably there–the page just didn’t get a chance to reload the cache. I’m sorry about that! And Mordred had better run. I swear I left a ‘Happy Halloween’ comment here. Also Wiglaf makes a good vampire.